Anyone else out there R-E-A-D-Y for fall? I know we (me and the P+CP) are! I can't wait to bring in some cozy autumn vibes into our shop + studio. It's been an exceptionally busy season for us here. From the closing of our first brick + mortar and reopening days after, to hosting over 20+ workshops and events this summer (and even our first out of Austin workshop), celebrating our official reopening with a weekend full of fun...I've definitely let our blog fall on the back burner. But we're back! And armed with our new creative intern who is committed to keeping The Paper + Craft Pantry blog on track with delivering awesome posts and content with all of you! Grace is an exceptionally talented creative who always has a knack for executing all the ideas I've had brewing in my mind + while adding an elevated touch to all of them. When I mentioned I wanted to create a simple D.I.Y. that would transition seamlessly from that summer mind set to the fall, I knew it would be perfect for all you wanting to find time to get creative as well as update your every day with simple accessories. Before we got started, we spend some time going over some design ideas as well as choosing a color palette that was fun enough for summer, but cozy enough for fall! We ended up with colors that were both in the same families as well as complementary colors and perhaps have found our new fall wardrobe color palette in the process! 1. Choose your color palette! COLOR HARMONY: From a visual standpoint, harmony is something that is pleasing to the eye. It engages the viewer and it creates an inner sense of order and balance. When something is not harmonious, it's either boring or chaotic. We ended up with gold, black, grey, coral, blush pink, olive and a leafy green. COLOR CONTEXT: How color behaves in relation to other colors and shapes. We wanted colors that were unexpected when paired together and were specific on the shape of the clay bead as it corresponded to the color of paint we used. We also considered this as we were stringing the beads together. 2. Roll out your air-dry clay in a variety of sizes and shapes! *Pro-Tip we laid down wax paper to keep our work surface clean! 3. Use the wooden skewer to insert a hole that goes straight through the clay bead- keep in mind that the skewer should be wider than the cord you are using. 4. Leave your clay beads to dry for at least 3 full days! 5. 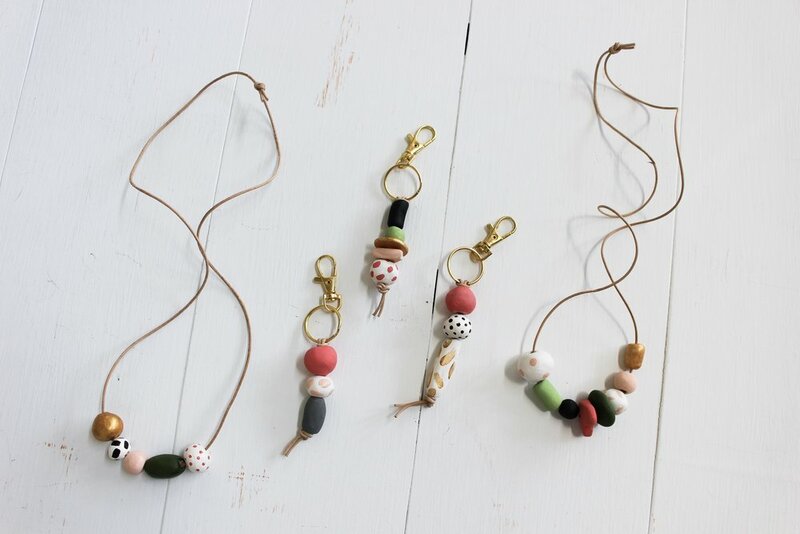 Once your clay beads are dry, paint them! They'll dry relatively quickly and be ready to string onto your cord within a few minutes. We made a variety of necklace and key chain combinations with all the beads we made! *Pro-tip: Spray a clear coat over the beats to avoid scuffs! What are your favorite summer/fall colors right now? Let us know in the comments below!